Here’s a report painting a VERY incomplete picture of “what a manufacturing skills gap of more than 2 million people will look like”. replacement, i.e. 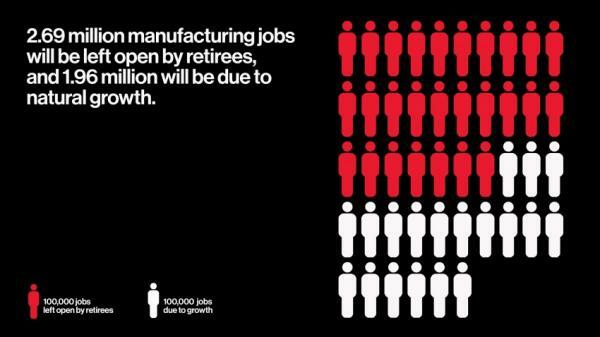 ~2.7 millions baby boomers currently working in the industry, but expected to retire over the next 10 years. The authors of the reports and its summary are worried because “there aren’t enough workers ready to take on these new roles” and, due to the ever increasing skill levels involved, it already takes an average of 93 days to fill those roles, compared to 70 in 2015. “enough jobs that the majority of people who will be fired in the next 5 or 10 years will be able get, with the kind of new skills they could realistically get before going homeless”. No way. No “industry 4.0” relabeling can turn such a fantasy into reality. And that is not even the biggest problem. Which is the one hidden in plain sight right into the “natural growth” part. That report is not about tourism, software development, financial services or other (theoretically!) “immaterial” sectors of the economy. It is about the manufacturing industry, that is “transforming physical raw materials (from recycling or mines, it doesn’t matter) into products”. It seems to me that any prediction of shortages in manufacturing jobs completely ignores the fact that there simply cannot be enough consumption of both energy and raw resources to create those jobs shortages. On one hand, the current scientific consensus on global warming should be enough to consider millions of high-skills, highly automated, “specialized manufacturing” jobs as simply not in line with reality: “Dress it up however we may wish, climate change is ultimately a rationing issue”. If that analysis is right, the “rationing” word alone makes that entire report on jobs shortages worthless. I do not have real answers to share now. This said, it seems evident to me that predictions on massive jobs shortages, or in general any proposal of massive retraining to compensate for technological unemployment, simply and completely ignore the issues mentioned in all the other reports and commentaries I linked here. Personally, taking those issues into account makes me feel that, regardless of my own opinions about it, a real Universal Basic Income may just be much realistic, and simpler to implement than any belief or plan to first achieve, and then fix, a “4.6 million shortage” in manufacturing jobs in the US alone. Maybe I’m completely wrong on this. OK. Still, it is depressing to see reports and advice that simply, completely ignore certain issues, and are built only on “continued growth of US manufacturing GDP in the coming decade” (source).